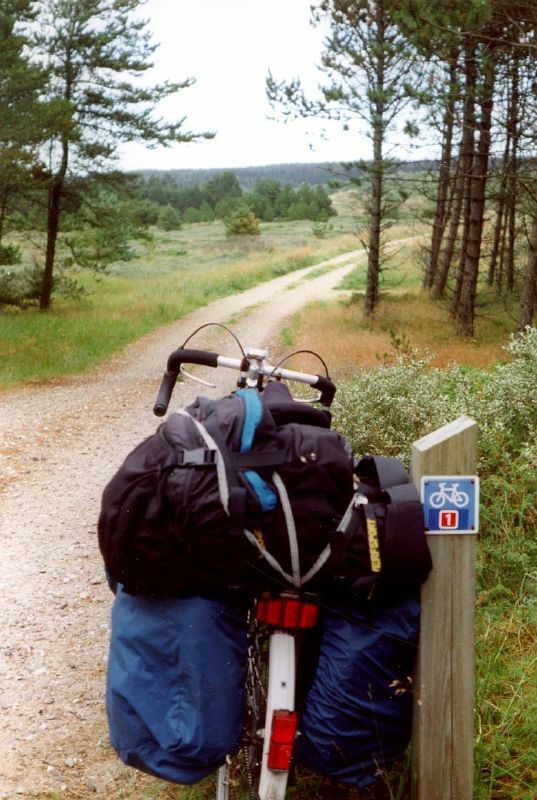 This year my plan is to get to know Scandinavia by bike. 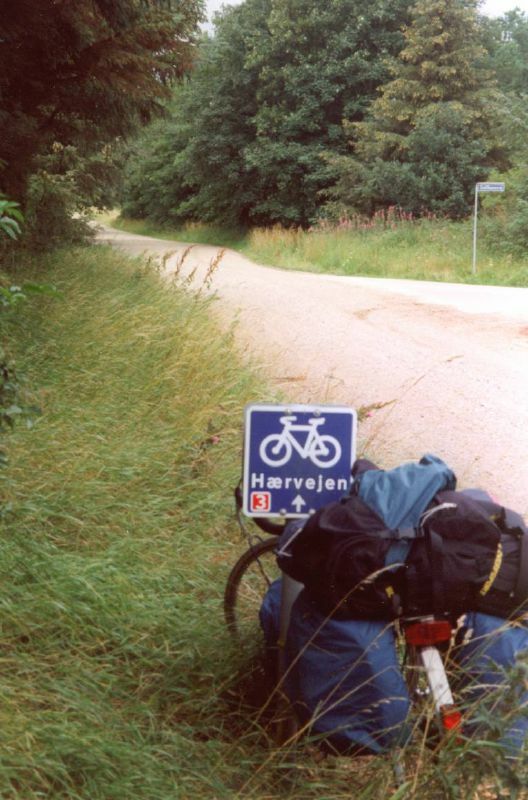 Unfortunately the cyclebuses to Denmark are already booked out, so I decide to cycle to my destination. Due to the unfavourable weather forecast the first stage, Amersfoort to Diphoorn, is covered by car. Except that the trees are taller, nothing much has changed at Dip. A test ride in the environs of Emmen (25 km) shows that all my equipment is in excellent working order. Today's weather is quite good compared with the last few days. The second leg is also done by car. After travelling via Nieuweschans and Leer (Germany), mum and dad set me down in the small village of Wiefelstede, where we tuck into a huge lunch at the local Greek café. After the worst showers have passed over, I hop on my bike about 3 o clock in the afternoon. 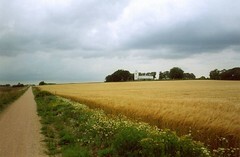 The first few kilometers lead through a flat polder landscape similar to the Gelder Valley at home. After shaking off a German shepherd (and later, accidentally, my rainpants too) I cross the Weser by ferry. The countryside becomes a bit hillier. Fields alternate with woods. Towards evening, after regularly taking cover in bus stop shelters, and with 97 kilometers behind me, I reach the camping ground in Bederkesa, where, quite dry, I set up the tent. At the campsite I meet 2 Belgians, who have been rained on for 2 weeks in Denmark, and now, somewhat disappointed, are on their way back home. A necessary visit to the local bike shop, because I lost my rainpants somewhere along the way. 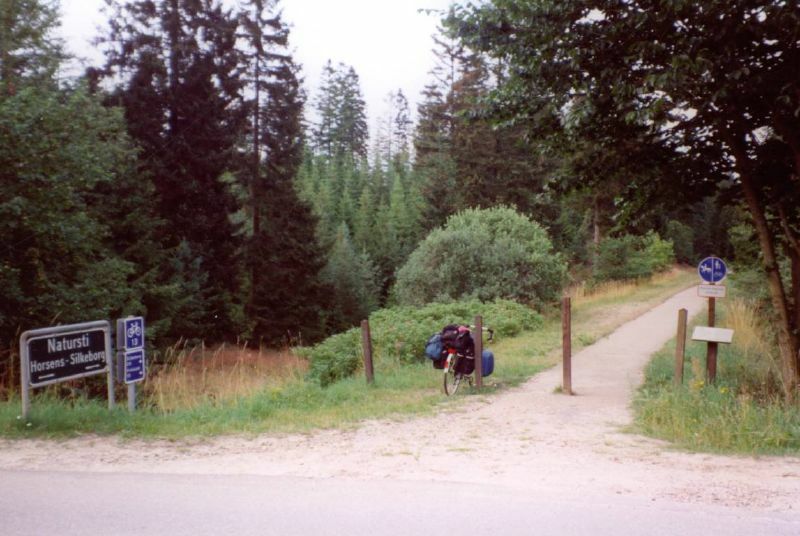 The route continues along small roads with little traffic, beside nice wooded hills (lateral moraines formed during the Ice age) towards the Elbe, which is crossed by ferry. 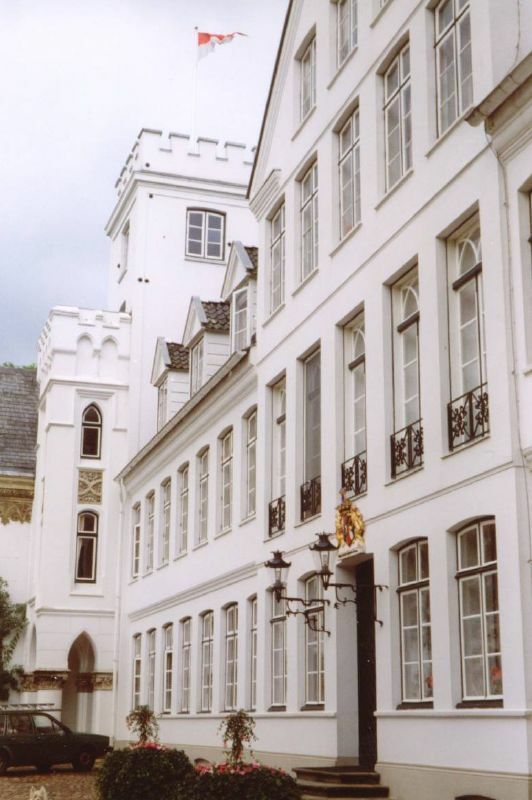 After a short visit in the nice little town of Glückstadt, I decide to go searching for one of the many castles owned by the von Rantzau family, who are distant relatives, according to some genealogical research (my great great grandmother was a van Ranzow). The castle is situated in Breitenburg, a small place in the vicinity of Itzehoe. 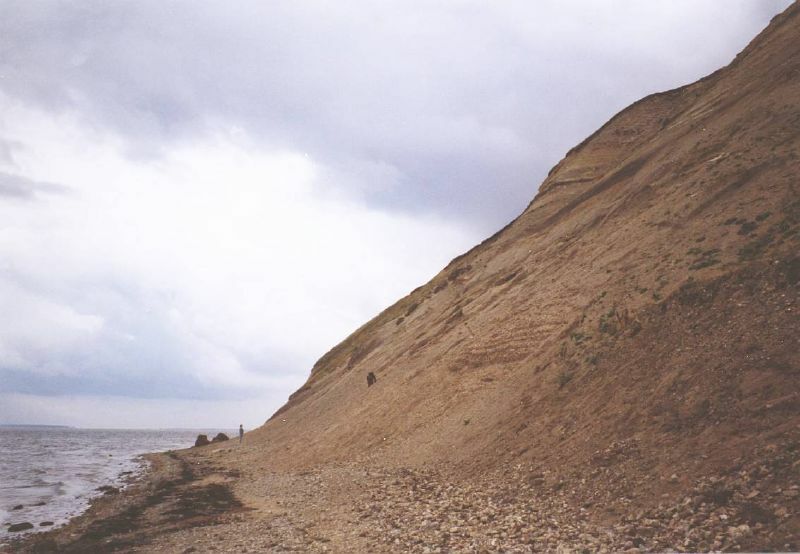 You can tell from the local dialect that Schleswig-Holstein belonged to Denmark in the not too distant past. Around Itzehoe the weather closes in again and it begins to rain steadily. After 133 kilometers I stop for the night in the "zur Hochbrücke" hotel in Grünenthal, indeed close to a high bridge over the North-East Sea canal. The route continues in a northeasterly direction. The showers aside, the rain depressions bring one advantage - I have a tailwind. 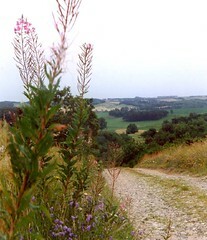 After Tellingstedt the country opens out, straight roads through a flat landscape of moors. 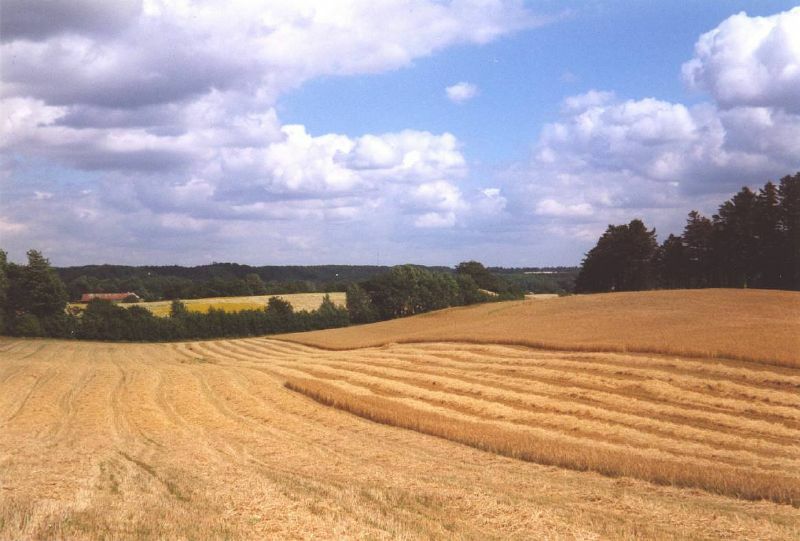 Around Schleswig via the Ochsenweg through a hilly landscape with many woods. After 11 km I stop for the night at the campground in Jarplund. After a Kaffee und Kuchen stop in Flensburg I reach the Danish border post via the suburbs and the Autobahn. 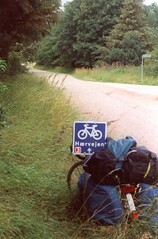 The Haervejen now becomes gravel paths over steeply sloping country. Along the way many cycling Danish families, recognisable by the colourful panniers and luggage trailers (often pulled by dad). 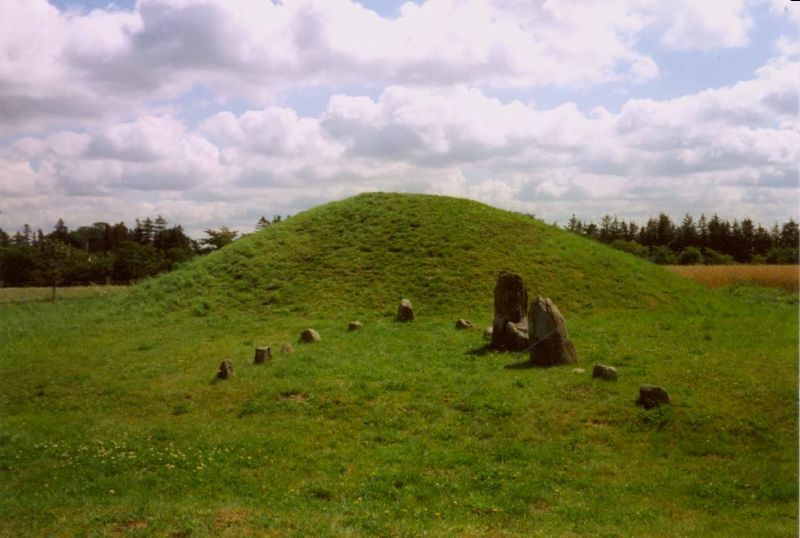 Near Baekke I visit the Klebaek Høje, two Bronze Age grave mounds (3000 years old), with remains of a Viking grave in the form of a ship. Twenty kilometers further on in the Randboldal four grave mounds with a splendid view over the pleasant hilly landscape. In Silkeborg it is time to send a few postcards. 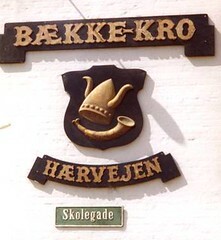 I pick up the Haervej route again just past the town. Along the way again many grave mounds. 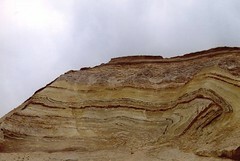 After a descent over a lamentably bad mud track, the route climbs up to Dollerup Bakker, a landscape created by glaciers. 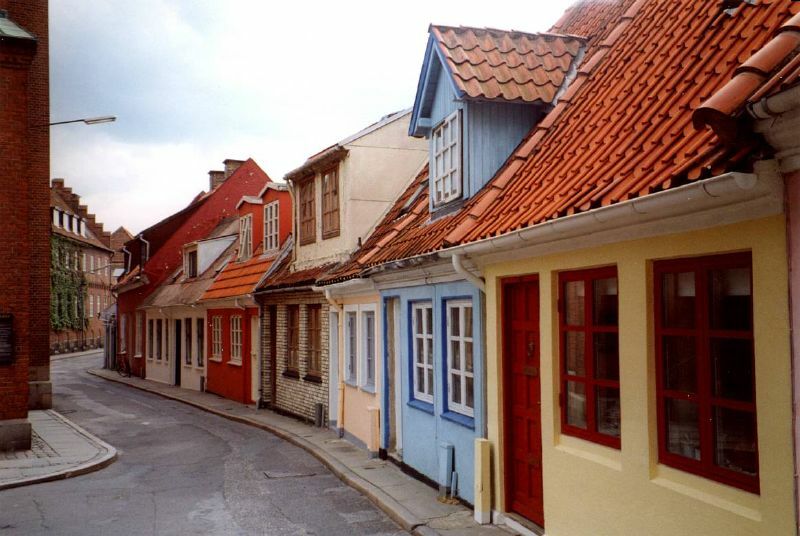 The Haervejen ends in the town of Viborg. 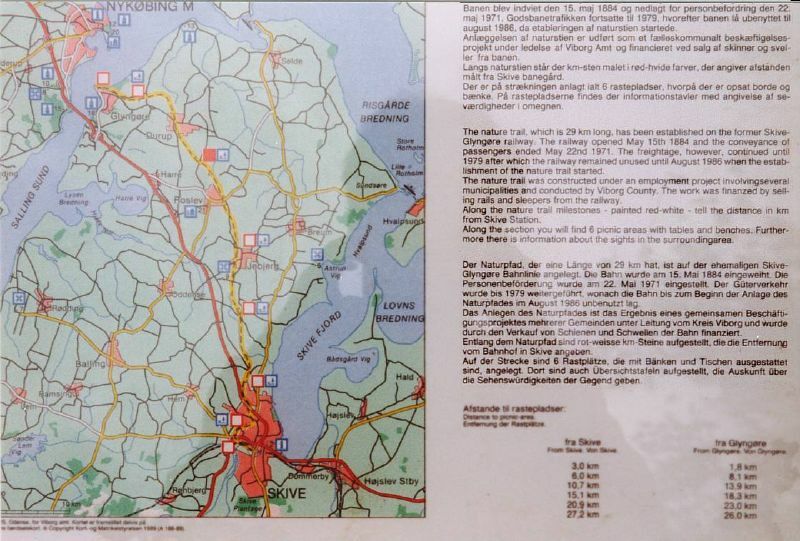 After glancing at the map and the ferry schedules for Norway I decide to head north west. Next sunday a boat leaves Hanstholm for Bergen in Norway. So after 82 kilometers I stop to camp at a hillside campground with a brilliant view of the eponymous fjord. 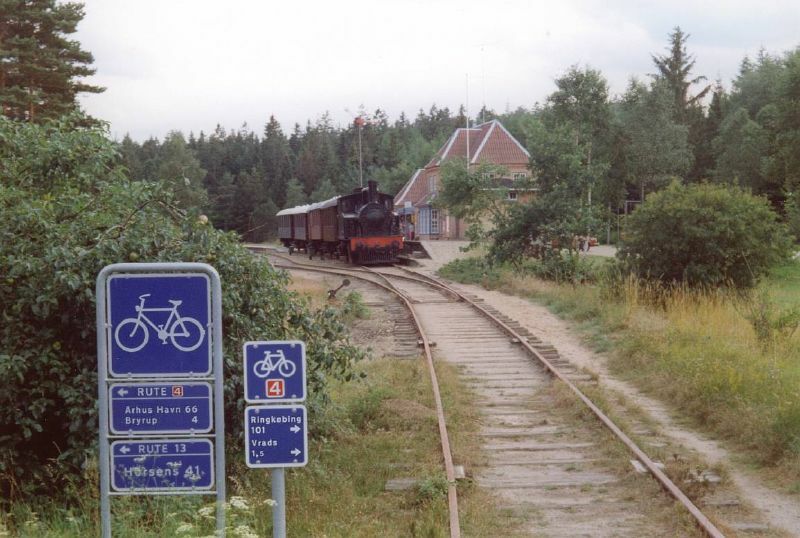 After Skive, Route 2 (Viborg-Hanstholm) carries on over a former railway. 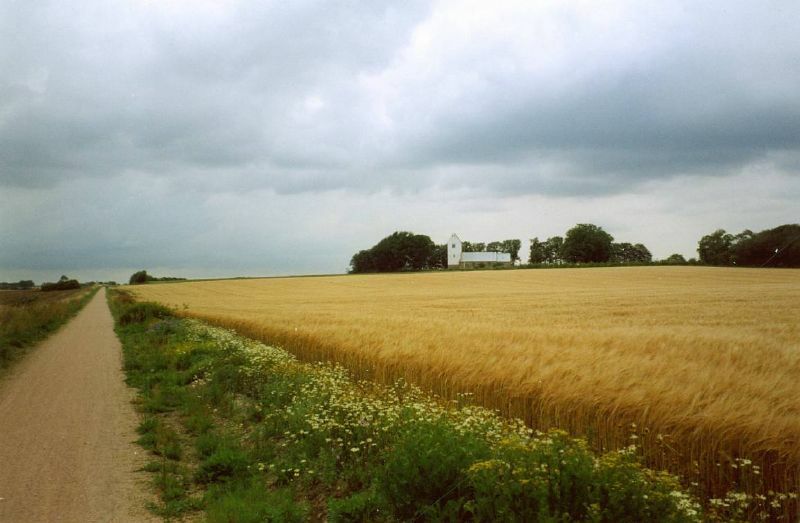 A flat landscape with cornfields, farms and windturbines passes by me. Via an imposing bridge I cross the Limfjord to the island of Mors. 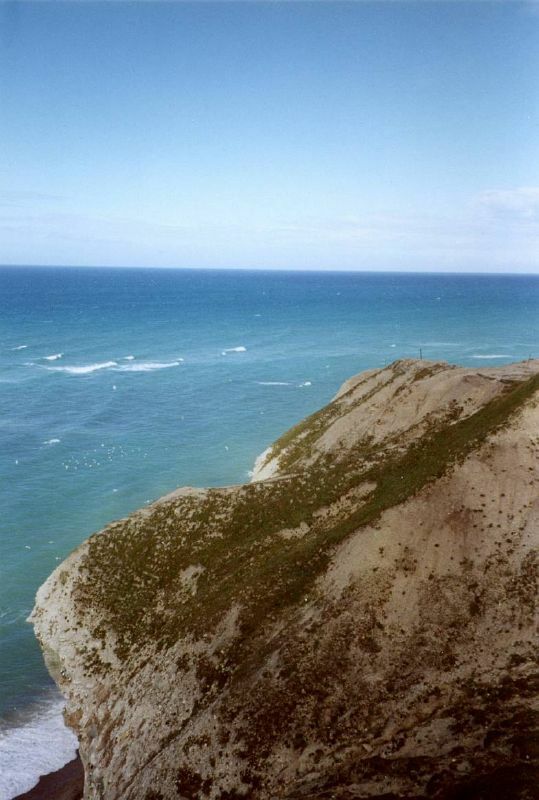 On the northern side of this island I visit the Hanklit. This is a cliff coast with nicely folded Moler deposits, near which, apparently, many fossils have been found. Following Route 2, I come to the next island, Thy. 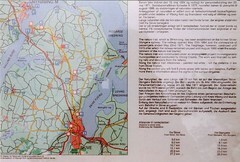 Alas the camping spots in the "plantations" described in the Cykelferiekort (cycle holiday map) are nowhere to be found. 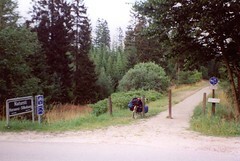 After 147k I look for one of the campgrounds in the seaside resort of Klitmoller. In Hanstholm I find that the 15.30 boat to Bergen is booked out. Seeing that the next boat doesn't leave until Tuesday evening, this means that I can spend another two and a half days having a look around Denmark. Route 1, a cycle path along the Danish coast, seems to be a pleasant bonus. Just outside Hanstholm the cycle route proper becomes a foot path. Averaging 5 k per hour through a deserted dune landscape I eventually get back to the signposted route. From the Skareklit nice distant views of the azure coast and its undulating hinterland. In a deserted dune area I stumble across a camping ground in a "plantation". 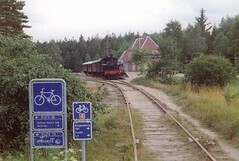 Route 1 continues towards Hirthals, I turn off along a former railway line in the direction of Ålborg. The smog cloud hanging over this industrial city can be seen from a great distance away. The town centre is really very nice. After looking around from the centre further westwards through a flat polderlike landscape with many wind turbines. 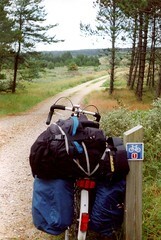 The campground beyond the pretty little town of Nibe is cut by a former railway line, now a cyclepath. Today back towards Hanstholm. The Nibe-Logstør leg crosses the nice heathlands of the Himmerland. After that there follows a boring, flat, windy polderscape along roads that at times are very busy with traffic. The last part again on Cycle Route 1 through the forest plantations, this time in the opposite direction. I arrive in Hanstholm in plenty of time for the ferry to Norway, which leaves at 23.30.